When photographing it was obvious to see that migration is in full swing. Singing and other territorial habits were rare and restricted to the earliest morning. This early morning on a sunny day (but quite cold in the first hours) was a real pleasure – also from the point of ornithology. In addition to the shots of the chickadees, it was possible to see and photograph birds like Common Wood-Pigeon (Columba palumbus), Eurasian Skylark (Alauda arvensis), Wood Lark (Lullula arborea), Blackcap (Sylvia atricapilla), Common Chiffchaff (Phylloscopus collybita), Fieldfare (Turdus pilaris), Mistle Thrush (Turdus viscivorus), European Stonechat (Saxicola rubicola), Black Redstart (Phoenicurus ochruros), Hedge Accentor (Prunella modularis), White Wagtail (Motacilla alba), Brambling (Fringilla montifringilla) and Chaffinch (Fringilla coelebs). 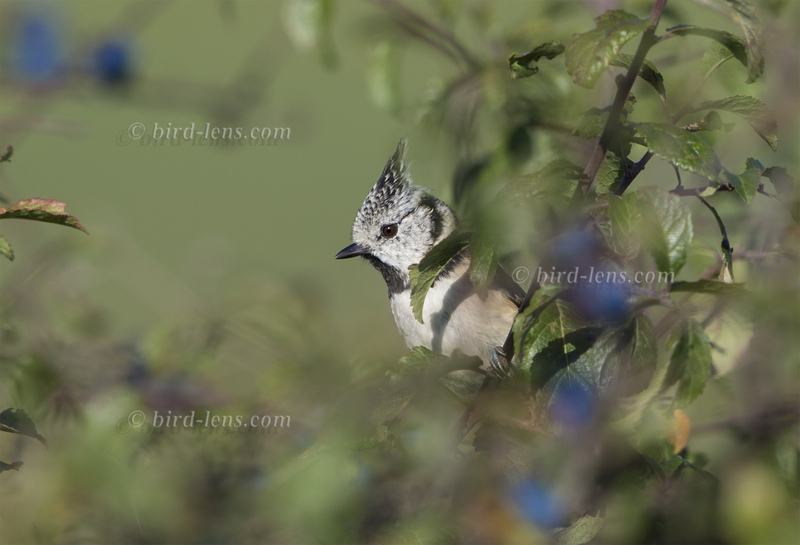 Good contributions to the bird-lens portfolio and possible to see soon here in the Gallery. In the early morning light I could even see a Eurasian Sparrowhawk (Accipiter nisus) flying low between a young conifer plantation below the summit of the Stockert. The flight of the Sparrowhawk showed a reminiscence to a nightjar. Very strange. The Stockert has an altitude of 433.9 m above sea level. The hill is not a real landmark but strategically located at the eastern edge of the Eifel about 3.5 km northwest of Bad Muenstereifel in the state of North Rhine- Westphalia. Albeit the hill is well-know, as on the wooded summit is a radio telescope. The telescope was built in 1956 and is the very first radio telescope that was built and operated in Western Germany. Now the telescope is a technical monument. I became aware of the Stockert and its importance to migration already years ago by an article in the “Charadrius” 39, Issue 4, 2003: 187-190, the journal of the Nordrhein-Westfälischen Ornithologengesellschaft (NWO) (engl: Ornithologists Society of North Rhine- Westphalia). The geographical situation at Stockert near the village of Eschweiler in the German federal state of North Rhine-Westphalia leads to the diumal, broad front bird migration in October being concentrated into a narrower stream. During a examination in October 2001 and from 29th September to 1st November 2002 a total of 18,180 birds of 39 species was observed during 12 days of observation. The ftve most abundant bird species were Sky Lark, Alauda arvensis (31.3 %)‚ Chaffinch, Fringilla coelebs (27.3 %)‚ Starling, Sturnus vulgaris (12.0 %)‚ Fieldfare, Turdus pilaris (9.8 %) and Wood Pigeon, Columba palumbus (6.6 %). The commonest raptor species was Eurasian Sparrowhawk, Accipifer nisus (35 individuals). The author of the article, Klaus Jaschke, mentioned, that If there is heavy migration, a single observer is not able to count all the birds. The biggest bird migration takes place in the morning at the Stockert approximately between 9.00 und 11.00 a.m. It is obvious, that the migratory birds on their way from breeding grounds come from the northeast. They fly over the Cologne-Bonn Rhine valley, the Zuelpicher plain and meet the rising heights of the Eifel. They apparently seem to follow the onward valley- cuts. Due to topographic reasons, the wide front migration is pressed to a much slimmer migration stream. Since they come from the lower level – around 140m asl – ,the birds usually fly low. One of the highlights were on 17th October in 1993. The migration showed large flocks of Common Wood-Pigeon (Columba palumbus). It was estimated that during that day a total of 10,000 migrating birds could be observed. In a flock, the author saw a small wader attracted to the pigeons; very likely a Eurasian Golden-Plover, Pluvialis apricaria, or a Common Snipe, Gallinago gallinago, which both are reported to migrate with Wood Pigeons. Migration situation is similar at the Randecker Maar in south-western Germany. Here, too, the migrating birds must overcome the Swabian Alb with a height difference of up to 500 m asl. Thus topography makes it suitable to detect birds migrating during the day. Already in the 1960s, a group of ornithologists observed on various passes and mountains of the Swabian Alb, south of Kirchheim unter Teck migrating birds and discovered the importance of the Randecker Maar for the passerine bird migration . The Randecker Maar, a former volcanic vent, is forming a valley-like incision. In addition, the downstream mountains form a funnel effect which feeds the migrating birds towards the direction of the maar. As a birder and photographer I am keen to contribute to Bird-Lens.com. To cope with the growing demand for top shots of the rarer species of the Palearctic, Bird-Lens is keen to enrich the range of pictures of birds you can find in the western palearctic. Trips of different contributers to remote places or to tourist spots to capture images of rare birds of western palearctic were very successful. The nice images you find in the gallery are only a first impression, what you will find in the gallery in the “Pictures Shop” very soon. Just give me a message, if bird-lens.com could serve you with an image needed before the new pictures are online.